Missionary Mom's Companion: Hospitality: The Perfect Ministry For Moms? I’ve been a mom for almost my entire experience in overseas ministry, and often I feel like I hear and experience the expectation that hospitality will naturally be the ideal ministry for me because I am at home with my kids much of the time. Usually I think people expect that it is one of the easier ways for young mothers to be involved in ministry and I’ve assumed this generalization to be truth until a recent freeing revelation. Hospitality is really hard for me, especially because I am a mom! 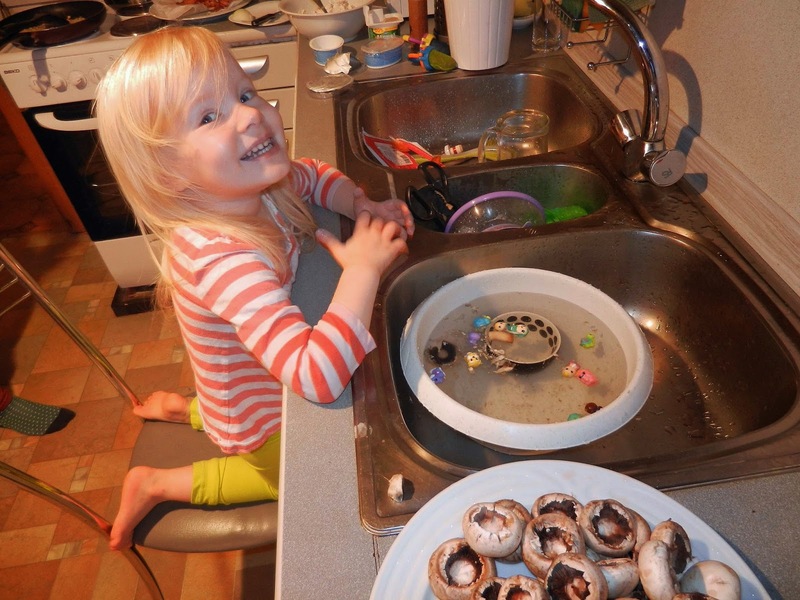 My sweet daughter "helping" me wash mushrooms that we were preparing for guests. She decided her little toys needed to use the scrubbing bowl as a swimming pool. I have often explained to my husband that trying to get our home ready for guests or events is like trying to build a brick building in the middle of an earthquake. Just as soon as I get one brick stacked, or rather one thing cleaned up or completed, the earth rumbles and multiple other bricks come crashing down, a.k.a. my little ones have urgent needs or the baby accidentally makes a mess out of the things that I’m trying to prepare for our guests. Yesterday was a perfect example. I had been prepping some food and left the dishes in the sink while I went to try to set up the living room for our guests. While moving a table, my little one-and-a-half year old managed to push the chair over to the sink and was having a blast splashing around in the soaking dishes by the time I got back. Needing to focus energy and attention to get my home and food ready means less attention for the kids. Less attention for the kids means more messes and additional work. Why am I writing this post? Am I trying to discourage us as mothers from practicing hospitality while we have little ones? Not at all! It is such a vital blessing and rich opportunity to minister to those around us. What I do hope to do, though, is to encourage you that this ministry that you are doing that might be seen by some as “easy” or “perfect” for moms, is actually really hard, especially for those of us to whom it does not come naturally! I personally think it is one of the harder things that we can do as mothers. It would be MUCH easier for me to leave my home and children and meet with people elsewhere, but hospitality is a gift of sacrificial love that we can give to people, and in reality, in some ways the logistics are easier since the kids are cared for at the same time that ministry is happening. But truly, hospitality on its own is a lot of work; Try to do it while simultaneously wrangling children and you’re effectively doing two jobs at the same time! Also, this should be another post entirely, but remember that hospitality and Martha Stewart are not synonymous. A lot of us need to lower our own personal expectations, especially when we’re trying to care for little ones and host at the same time. There are times for elaborate spreads and times for simply inviting people into the mess of daily life. Both types of hospitality, and everything in between, can be equally as much of a blessing to those welcomed in. How about you? Does hospitality come naturally, or is it a challenge? What are some ways that you’ve been able to minimize the stress of hospitality, especially in the phase of life with little ones? Ashley, I couldn't agree with you more! Hospitality is HARD with kids, but it is a labor of love and sacrifice. (So true that people expect it to be "a natural" for us since we stay at home with kids!) Thanks for this encouraging word to give ourselves permission to feel challenged! My best tip would be to let go of perfect and develop a your own style of easier, more do-able hospitality, whether it's cooking up a pot of simple soup or using paper plates. Just being real. Hospitality does not come easy for me. (When I had children at home, and now that they are out of the house.) For me though, it has more to do with lowering my expectations and make it about the people and not about the food or the perfection of my home. The more I've done that, the easier it has gotten. (And when my children were still at home it made for much less stress when Mom didn't expected them to be perfect!) But a book our team is currently studying together, Cross Cultural Servanthood, has taught me that hospitality isn't just about opening your home up, but also being open as a person. The more I've tried to do that the more I find myself ministering to people in a casual setting. Such as at our last missionary Harvest Festival party. I stopped to ask a struggling, young mom a question and it turned into 30 minutes of listening and encouraging. She later wrote to tell me she felt safe to share and was continuing to think about what I had said. The author, Duane Elmer's definition of openness is: "the ability to welcome people into your presence and make them feel safe." Who doesn't need a safe place to be themselves and to share their burden?! I love both of your responses, Betsy and Tammy! Yes, Betsy, I am so with you on keeping hospitality simple. Even when I do that it is still plenty of work, but definitely a labor of love. I can't wait to read your posts. I actually think i read and enjoyed them when you first posted them! Tammy, I really love your comment about hospitality being much about being an open person. I think ditching the perfectionism in hospitality sets a perfect atmosphere for such openness. It can be so tempting to want to look like the missionary moms who have it all together, but how does this sort of facade really help anyone feel ok about being open with their own imperfections? I have not heard of the book that you mentioned, but really want to go find it. It sounds great! Also, that is so encouraging about the young mom you were able to encourage. Praise God for the blessing of this God-ordained opportunity for hospitality. Wonderful post, Ashley! It's so true that hospitality doesn't come easily with little ones underfoot. I've been thinking about this a lot lately as I've been reading through the She Reads Truth study on hospitality. It's not just welcoming people into our homes with everything perfect. It's opening our hearts to the hearts of those coming into our home as Jesus would. LOVE this, Ashley! And it doesn't get easier with teens in the house because you expect them to take care of their messes and then when they don't, it's just that much bigger because they are bigger (if you saw the basement outside my big girls' bedroom right now, that would be a case in point!). Hospitality doesn't come easily for me, but several years back, the Lord convicted me of my need to be more involved in opening my home to people... of actually having an open door where people felt welcome any time they stopped by, with or without advance notice. It is my personal opinion that God commands us to practice hospitality partly because the very act of preparing for others to feel welcome in my home/in my presence reminds me that I have to prepare my heart, have a gentle, teachable spirit willing to adapt to circumstances and events as they happen and not consider my agenda as the priority to welcome God into my life in those areas that are uncomfortable or difficult or where I'm more naturally selfish. In some senses, I feel like God has used the ministry of hospitality to "domesticate" this "wild" naturally selfish and first concerned about my agenda sort of woman... if that makes sense. My biggest eye-opener was when a couple invited us over and there was no smell of food when we walked into the house. Did we get the wrong night? After visiting for a few minutes, the wife said, I worked all day and I want to visit, not cook. Tell me what you want from Burger King. Her husband and mine made the run and we enjoyed the evening tremendously, as my kids never got fast food during those economically difficult years. My idea of hospitality changed that night. I love that she was comfortable enough to simply tell it like it was! Thanks for sharing this example! Wow, that's a great idea! Hospitality is definitely more about the person than the details.